From right, Keith Van Dyke shaves Don Tabberer’s head as Linda Tabberer watches her husband’s hair slide to the floor. A canned-food drive for Thanksgiving triggered a contest between youth and adult Sunday School classes at Sand Springs UMC. The campaign caused Pastor Don Tabberer to lose his hair — and helped restock the pantry at Restore Hope Ministries in Tulsa. Sand Springs’ youth director, Graeme Collett, challenged the young people to collect more canned goods than the adults. A point system was devised for each type of food needed by Restore Hope. Over four Sundays, the piles of donations grew. Collett extended his challenge to Rev. Tabberer. If the adults won the contest, the youth director agreed to shave his head and the youth agreed to serve breakfast to the adults each Sunday for a month. If the youth won, Tabberer would shave his head. On Nov. 18 the results were announced and Tabberer became newly bald. 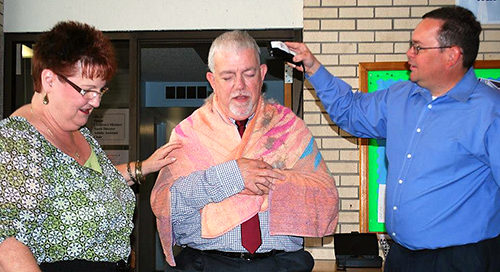 Keith Van Dyke, chairman of the Restore Hope board, was at the church to serve as barber. "I think it’s important that we do something dramatic to help our youth be enthusiastic about helping others," said Tabberer. "Losing my hair is a small price to pay; it will grow back."